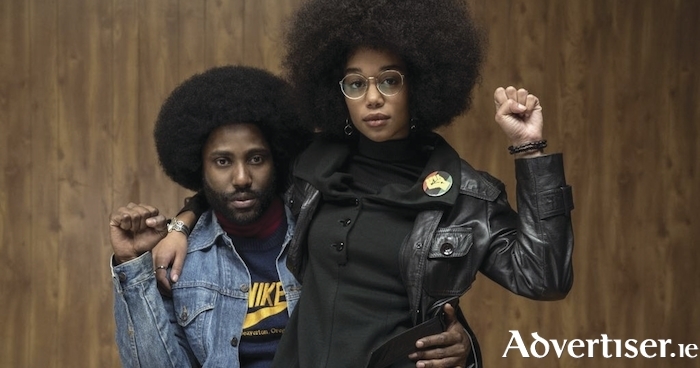 John David Washington and Laura Harrier in BlacKkKlansman. BASED ON the true story of Ron Stallworth, the first black police officer in Colorado Springs and who managed to infiltrate the Klu Klux Klan, BlacKkKlansman feels like a spiritual successor to director Spike Lee’s Malcolm X and Do The Right Thing. Stallworth infiltrates the Klu Klux Klan over the phone, and with the help of a white Jewish partner, who appears as a surrogate, he manages to bring down the local KKK chapter. At times it is farcical, but due to the subject matter the laughs are always slightly uncomfortable. Stallworth is played brilliantly by John David Washington (son of Denzel ). I wonder would the movie work as well with any other lead. Like his father, he is incredibly charismatic, and there is a fine supporting cast featuring Adam Driver and Laura Harrier. This is one of the better acted movies of the summer, with a particularly impressive performance from Topher Grace as KKK Grand Wizard (still active ) David Duke. Spike Lee's confidence in comedy has come on hugely in recent years. He is not afraid to have straight up gags in this film, although it may have worked against him in terms of marketing, as the film seems to be billed as a comedy caper. No matter, as I cannot imagine anyone who sees this film will be disappointed. I went into this with high hopes and my expectations were exceeded. Like all films based on true stories, there are some changes to the real events but when looking up the facts, some of the more outrageous aspects of the movie tended to be true. Without spoiling anything, the final 10 minutes brings the story up to modern day, with Lee moving from a jokey tone to a completely earnest and exasperated one, with footage of the white suprematists' march in Charlottesville and speeches from David Duke and Donald Trump. It is one of the more powerful moments I have had in a cinema this year.